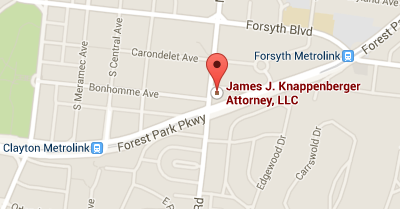 Sites listed herein are not under the control of James J. Knappenberger, Attorney, L.L.C. Accordingly, James J. Knappenberger, Attorney, L.L.C. can make no representation concerning the quality, safety or suitability of the content of these sites. Nor does the fact that any link is included, serve as an endorsement of that site. James J. Knappenberger, Attorney, L.L.C. is providing this site, the information, listings and links contained herein only as a convenience to you.